It's pretty difficult nowadays to talk about anything wealth-related without somebody throwing Dubai's hat into the ring. If general affluence is being discussed, Dubai will most assuredly end up as a point of conversation. Still, that's no excuse to be caught with your metaphorical peasant pants around your ankles. In order to keep you up to date with the affairs of the affluent, I've composed a list of the most expensive foods Dubai has to offer. Instead of finding the five most overall expensive dishes, and with the help of the minds over at The Richest, I decided to focus on specific categories (most expensive pizza, sandwich, etc), since most of them are recognizable worldwide and aren't region-specific. Surprisingly, the most expensive sandwich in Dubai has very few ingredients in it. It's the quality of the ingredients themselves that make it insanely expensive. 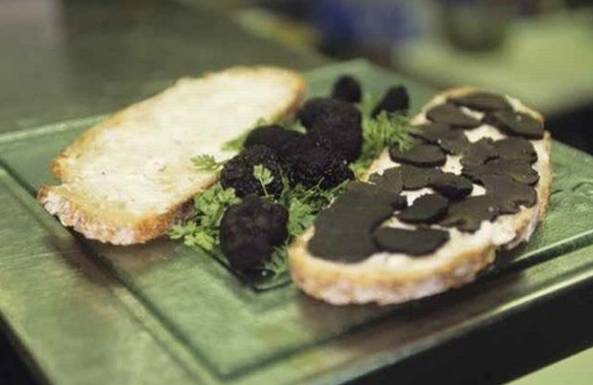 The sandwich's insides consist of a little bit of salt, some butter, some thinly sliced black Perigord truffles and two slices of bread. That's it. A minimum wage employee in California would have to work about nine hours to afford this sandwich. Let that settle in your mind for a second. Before this pizza was made, the previous defending world champion for most expensive pizza was a creation by Gordon Ramsey that he served in his restaurant, The Maze. 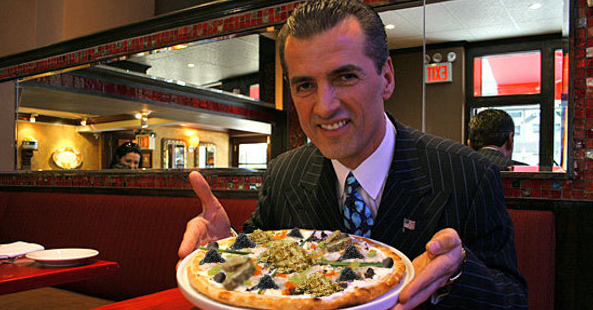 His pizza sold for a little over $2,000, making it cost less than 1% of the current titleholder. "Royal Pizza," the name of the pizza created in the uber-elegant Dubai restaurant Pierchic, was originally intended as a one time pizza for, you guessed it, Dubai's royal family. The ingredients include: white Italian truffles, black Perigord truffles, French foie gras, Mongra saffron from Kashmir, Beluga caviar soaked in Dom Perignon, Japanese matsutake mushrooms and two full ounces of gold leaves. Bloomsbury, a small boutique cafe in the Dubai Mall, celebrated it's one year anniversary in 2012 by creating this Herculean cupcake. 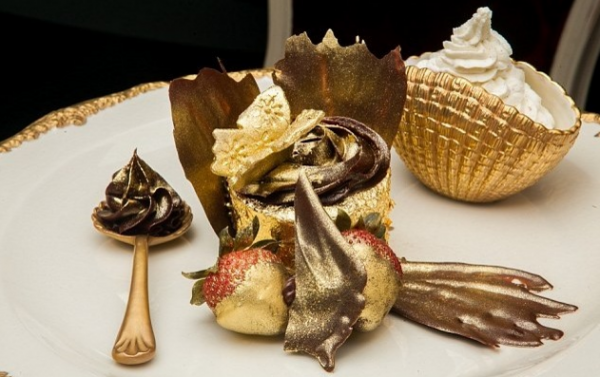 The gold-adorned cupcake, aptly named the "Golden Phoenix," is made using 23-carat gold sheets, Ugandan vanilla beans, Italian chocolate, and gold-dipped strawberries. Considering how demanding it is to make and the quality of the ingredients, it comes as no surprise that the noble bakery requires a 48-hour notice in order to build this cupcake of the Gods. This ice cream sundae, called The Black Diamond, is just another opulent win on Dubai's scoreboard. 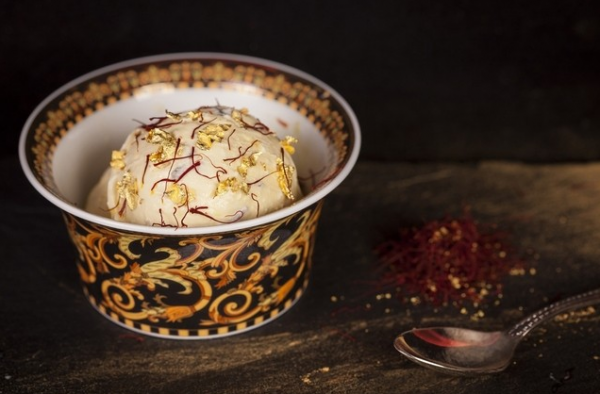 For $817, you get one scoop of Madagascan vanilla ice cream infused with a rare and expensive Iranian saffron and black Italian truffles. Of course, this IS Dubai we're talking about, so naturally the scoop comes with 23-carat gold sheet flakes sprouting from every which way in the scoop. On top of that, an ice cream scoop so decadent and gaudy could only be served in an equally fancy bowl, which is why the Black Diamond Sundae is served in a Versace bowl and spoon, both of which the customer is allowed to keep. At this point you must be thinking, "Yeah, yeah, just tell us how much edible gold is in this thing and move on." Surprisingly, there's none. Well, none inside the drink. 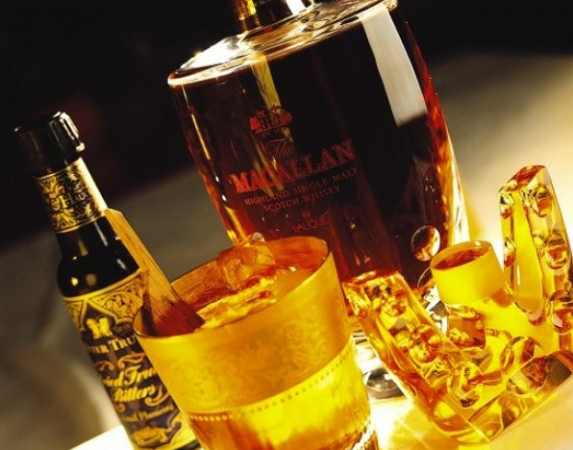 The cocktail is made with Macallan 55 year old single malt, self-prepared bitters, homemade passion fruit sugar, then topped off with ice cubes made of water from the Macallan distillery in Scotland. The drink even comes with a stirrer made from one of the oak casks. Served at the Skyview Bar of the Burj Al Arab hotel, the cocktail known as the "27.321" (due to the drink being served on the 27th floor and the building itself being 321 meters tall) comes served in an 18-carat gold glass that officially belongs to the customer once purchased.